Examine your own narrative. We speak over 50,000 words to ourselves in self-talk each day. How do you talk to yourself? Do you say “I can”, “I’ll try”, “I can do better”? Or do you catch your inner voice saying “I can’t”, “that’s how it is,” or making excuses? To keep track, put a rubberband around your wrist and switch it to the opposite wrist every time you catch yourself giving your power away. Be smooth like water. Reactive people are like soda. Bubbly. Impulsive. Exploding when shaken. On day two, your mission is to react more slowly, based off values, not impulse. At the end of the day, write down three instances when you reacted deliberately and smoothly, instead of impulsively! Beware the deadly “Victimitus.” Remember the sky rain-dumping on you as you walked to the job interview? If you tell yourself you didn’t get the job because the rain made your hair puff up like Chewbacca, you may have unconsciously contracted this ailment. On day four, reflect and write upon this question: Do I play the blame-game when things don’t go my way? Understand what you can and can’t control. Every time something bad happens, ask yourself if it’s in your domain. Weather? Another person’s actions? Stores having your favorite candy in stock? Those are not yours to control. So why bang your head up against the wall feeling angry when there’s nothing you can do about it? On the other hand, how you react to all of these things is in your control. On day 5, when you find yourself getting annoyed at something outside your domain, practice shifting your attention back to what you CAN control: you! Turn setbacks into triumphs. Our CMASAS students know that there is no such thing as failure, only feedback. Using what goes wrong as information instead of a “why-God-why” kind of moment helps us, as Henry Ford said, “begin again more intelligently.” On day six, find something you felt you “failed at” recently. Instead of getting caught in the emotions of the memory, ask yourself how you can be proactive and use the experience as a springboard to create something better? Habit 2: Begin with the End in Mind. Define your mission and goals in life. Your life is like a huge 1,000 piece puzzle. If you don’t have the picture on the box telling you what it’s going to look like, it’s going to be murder trying to connect the pieces together. To know where you’re going, you have to first know who you are. So treat yourself like a corporation, and develop your own personal mission statement! This should include important information about you, like your values, what you stand for, your talents, what inspires you, and who you’d like to be a year, five, ten, twenty years from now. This personal mission statement should act like the roots of a large tree- it will keep you grounded so you can make big decisions like who to be friends with, what risks to take, and what values you want to live by. Think of a person who’s positively affected your life. What qualities does he/she have that you would like to emulate? It’s 20 years in the future. What are you doing, and who’s with you? There’s a thin plank of wood balancing between two sky-scraping cliffs. What would make you cross it? Money? Your little brother? Candy? Be honest! Think back. Describe a moment when you were deeply inspired. 10 things you love to do. Go! You’re in the greatest library in the world and have one day to study anything you want. What is it? It’s 5 years from now. The news is doing a big story on you. What does it say, and who are the three people in your life they’ll interview? What flower, song, or animal represents you and why? You have one hour to talk to anyone, alive or dead. Who is it, and what will you ask? What are your unique talents? What brings you joy? Once you’ve answered these, consider the picture it paints. Think about what your puzzle box picture would look like, and create a simple personal mission statement saying who you are, what you care about, and what your values are. Habit 3: Put First Things First. Simply put, this habit is about learning how to prioritize and do the most important things first. To begin, you must learn the difference between what is important and what is urgent. Important might be that book you’re writing (the one with no pressing deadline.) Urgent might be that story in your news feed you’ll never find again if you don’t read it NOW. To help prioritize important tasks over the urgent (but not-important) ones, Covey shows us how to plan ahead using the “Big Rocks” theory. Big rocks” are the most important things you want to do that week, and should be connected to your personal mission-statement and longer-term goals. Habit 4: Think Win-Win. Have an everyone-can-win attitude. This week, examine how often you compare yourself to others. Notice when you feel threatened or competitive. Notice when you feel closed off, isolated, or back in that dreaded land of Victimitus. These are all great indicators that you’re unconsciously thinking Win-Lose, Lose-Win, or Lose-Lose. Pinpoint an area of your life where you struggle with comparisons. If you play sports, show sportsmanship or compliment an opposing player. Have a test? Form a study group and share your great ideas, knowing everyone will benefit. Play a game for fun, not caring if you win or lose. The next time a friend gets a win, be happy for them by keeping yourself (and those nasty “tumor twins” comparison and competition) out of it. Look for a role-model who has a Win-Win attitude. Study what they do, and let that help guide you as you practice it yourself! Habit 5: Seek First to Understand, Then to Be Understood. Listen to people sincerely. Our students have the good fortune to be enrolled in a school with an international student population. Learning to be a genuine listener opens so many doors, not only in creating deep, meaningful relationships with others, but also in expanding our personal understanding of the world. Listen with your eyes, heart, and ears. Language is multi-faceted. Tone and body-language makes up a huge amount of our communication. That’s why it’s so easy to have miscommunication over text or email! If you’re communicating online, try to use video-based chats like Skype or Zoom. Pay attention to the whole person, and watch for these clues. It will paint a far more complete picture of what they’re really saying. Stand in that person’s shoes. We’re all completely different. What about the person you’re talking to might color their world-view? How might their unique life look different from yours? By celebrating diversity, we keep ourselves humble, always open to learn and grow. Practice mirroring. Mirroring is reflecting back what the person says so they know you’re listening. Five mirroring phrases Covey suggests to start with are: “It sounds like you feel… So, as I see it . . . I can see that you’re feeling . . . You feel that . . . and So, what you’re saying is . .
Give feedback. Once you’ve worked to understand someone else, let them understand you. Speak your truth and offer feedback with compassion. Habit 6: Synergize. Synergy is when people work together to achieve far more than they ever could alone. This isn’t just two minds making double the solutions. True synergy means tripling or quadrupling our gains. Here’s Covey’s five-point action plan for increasing Synergy in your life. Define the problem/opportunity facing you. In one sentence, what’s the core issue at hand? Make sure you know what it is, or you’ll be going in circles. Ex: Mom and Dad want me to go on a trip, and I want to stay home with my friends. Their Way. Seek to understand. Ex: How do your parents feel? Why do they want you to come on the trip? What’s their reason for you to not stay home? Use active listening to engage them by using techniques like mirroring. My Way. Seek to then be understood. Ex: Why do you want to stay home? Remember to use Covey’s “I before You” sentence structure! Brainstorm. Create new options and ideas. Get creative. Piggyback of each other’s best ideas. Avoid criticizing ideas you don’t like- that will shut down the synergy. Habit 7: Sharpen the Saw. Covey’s final habit for highly effective teens is to renew yourself regularly. Cutting down a tree will take twice as long with a dull blade. So be sure to take time to care for yourself, so you’ll have more energy to do what’s needed later on! Take care of the body. Notice what you eat. Your sleeping habits. Your exercise habits. A healthy body will take you so much farther, and with greater ease. Take care of the brain. The greatest tool toward doing this is getting a good education and broadening your experiences. This is why we at CMASAS know just how important providing a personalized education is-- it allows our students to grow more quickly and fully into their most essential selves, while also absorbing all the smarts and skill they’ll need to succeed. Take care of the heart. Today, laugh. Keep a promise to yourself. Be gentle with yourself. Recognize your talents. Commit a random act of kindness. All these will renew your heart. Take care of the soul. What inspires you? Awakens you? Returns you to that pure state of child-like joy? Take time each day to renew your soul, whether it’s being in nature, playing an instrument, or dancing like you did when you were five to your favorite song. 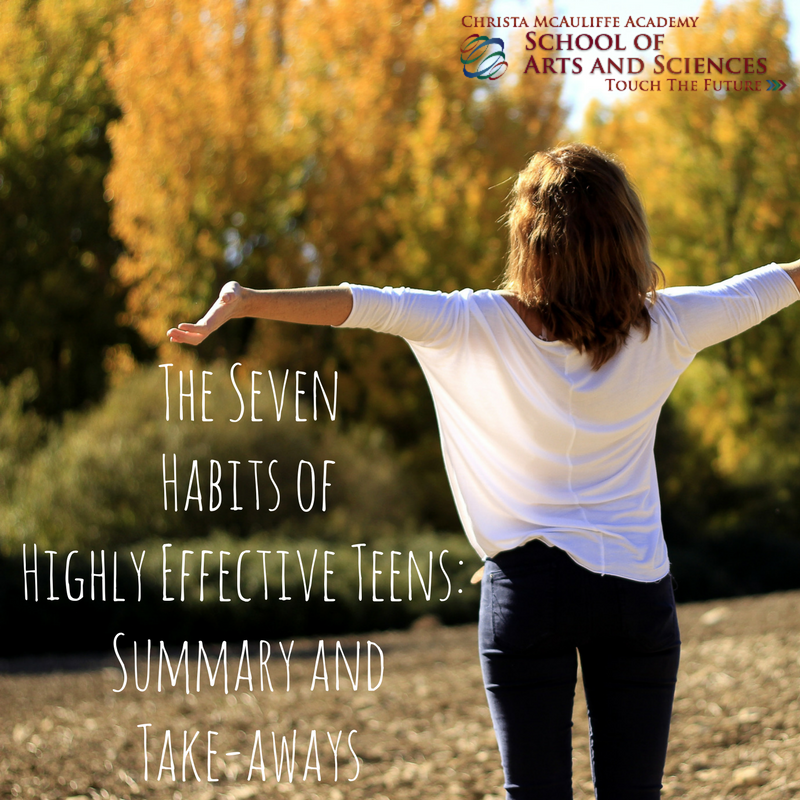 Thank you for joining us through this mini-series as we explored Sean Covey’s Seven Habits of Highly Effective Teens! Which habit has worked best for you, and why? Which ones give you trouble? Let’s start a conversation! Remember, it takes time to change our habits. Here at CMASAS, we are committed to helping each child become his/her greatest self. And it all starts with personal agency.